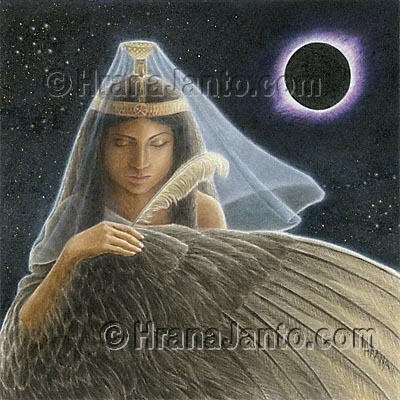 I painted Nephthys for Llewellyn's 2001 Goddess Calendar. The Greek version of name is more common than her original Egyptian name, Nebthet. She was Isis' sister, and opposite: Isis was the force of life and rebirth; Nephthys, the tomb-dwelling goddess of death and sunset. They had similarly opposite mates. Isis' consort wasthe fertility god Osiris, while her sister's mate ws the evil god Set. Set was not only wicked but sterile. So Nephthys, who wanted children, plied Osiris with liquor until, forgetting his loyalty to Isis, the god tumbled into bed with Nephthys. That night she conceived the god Anubis. Set, possibly out of jealousy, then killed and dismembered Osiris. This proved too much for Nephthys, who left Set to join in her sister's lamentations and helped to restore Osiris to life.